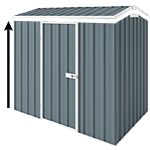 Absco's best selling aviaries are made of all steel construction and that makes them easier to clean and more hygienic. This aviary comes with wider mash panels (standard mesh is 12.5mm sq x 1.2mm thick) that gives you a better view of your beloved pets. They can be used as dog kennels, catteries, hen houses or animal shelters. For permanent secure installation of your aviary it is recommended to use anchors. 12 anchors are required with this size. Thank you for your question, much appreciated. The holes in the mesh of the aviary is 12.5 mm sq. Should there be anything else that we can assist you, please do not hesitate to let us know. Hello Glenys, thank you for your question. We are 100% based online so we don't have any show rooms. Our aviary suppliers are in Brisbaneand NSW but unfortunately we don't have a physical place for you to visit. The brands can be found in some local hardware stores however by being online we are able to provide very competitive prices, a larger range to choose from and more often than that a better post sale service. Timber Flooring Kit (5) to substitute concrete slab. Made from 100% Australian renewable plantation grown timber. Comes with 10 Years Warranty. Dine-A-Chook - High quality 3 litre Drinker and Feeder to ensure rain and rodents are kept out of your chooks food and drink.